Prototype: Privately owned car painted and lettered for the International Model Railroading Day on December 2. Model: The sides of the car are imprinted differently. The car has Relex couplers. Length over the buffers 11.5 cm / 4-1/2“. DC wheel set E700580. A Good Idea Grows Continuously There is no better time to experience a model railroading day than before Christmas. For ­generations this time has been set aside for this beautiful hobby. A cooperative group of model railroad associations, manufacturers, clubs, and publishers has been formed at the initiative of Hagen von Ortloff – known from the SWR TV series Railroad Romanticism. All of the players in this group want just one thing: to celebrate in an ­appropriate manner the most beautiful hobby in the world – model railroading – and to inspire people for this hobby. Many clubs will open their doors around December 2 and all over the world, many model railroads will go into operation. 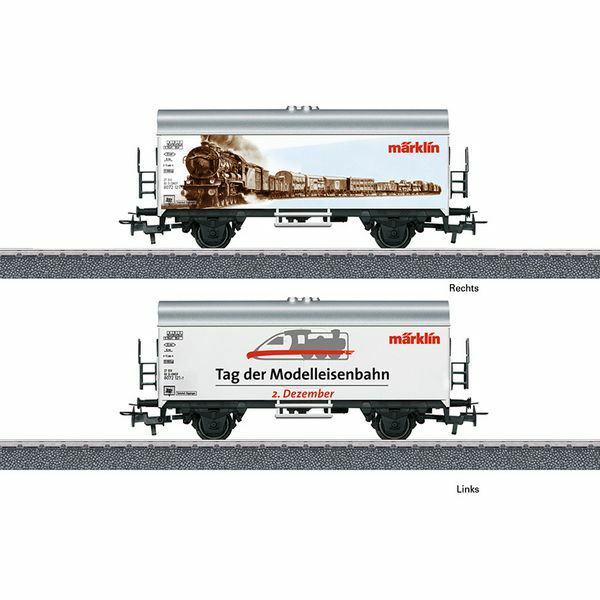 Promotions revolving around the hobby of model railroading will take place all over Germany, even all over Europe. Be part of it! Experience an unforgettable day with your family.